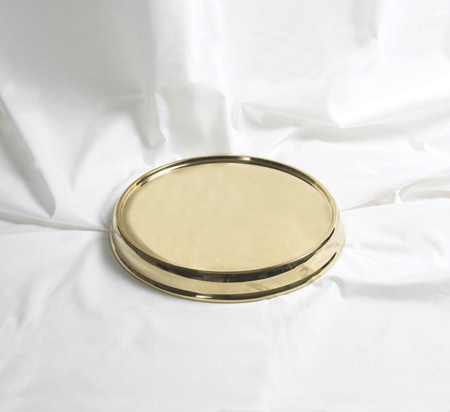 Celebrate Communion's traditional, brass-colored stainless steel Communion tray bases are made of high-quality, food-grade stainless steel. 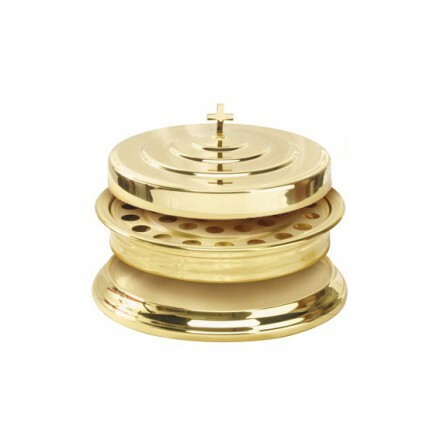 These handcrafted Communion ware pieces are created with a highly polished brass finished bonded over stainless steel in a special anodization process. This is the base that will support and give added stability to your Communion trays when they are stacked. Tray bases lend support and create a dramatic foundation for our elegant matching Communion trays. The base is a standard size (1 3/4" high and has a diameter of 8 1/4"). All edges are hand-finished and double rounded to ensure a smooth and safe surfaces. All Celebrate Communion Communion ware is easily cleaned with mild soap and water and a soft cloth and include a 5-Year Guarantee. Special Note: Not sure how many Communion trays, tray covers and bases to order for your church? Check out the handy ordering chart at the bottom of this page!